Gorgeous Cradled Swirl Diamond semi mount. Diamonds total 1/4ctw before your center stone. Our price shown is for the SI 1-2 clarity G-H color diamonds. Order this charming design in 14k white, yellow, or rose gold. We offer an incredible selection of great diamonds that will fit this ring perfectly. Ring is made to order non returnable so choose your metal color and size. Matching band also available at additional cost. Beautiful 14k gold diamond semi mount. Order this charming design in 14k white, yellow, or rose gold. DIamonds total 1/4ctw before the center diamond (not included). This diamond semi mount is set to hold a 1/2 carat center round diamond, we have an incredible selection of great diamonds that will fit this ring perfectly. Ring is made to order non returnable so choose your metal color and size. Diamonds are SI 1-2 clarity G-H color. Matching band also available at additional cost. Gorgeous Diamond semi mount. This beautiful pave desgn diamond semi mount is set with 162 dazzling SI 1 clarity G-H color diamonds that cradle your center diamond (not included). Shown in 14k white gold also available in 14k yellow gold, 14k rose gold, and Platinum. Email for additional information and use our diamond data base to find a perfect center diamond for this diamond semi mount. Stunning 14k Gold Diamond Pave twist semi mount. This beautiful diamond semi-mount is available in 14k White gold (shown), Yellow gold, or Rose gold. Also available in Platinum. Ring will hold a 1/2 carat, 3/4 carat, or full carat center. 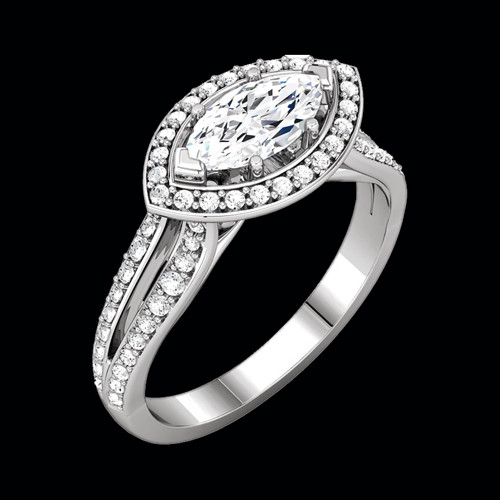 Semi-mount is set with .05ct accent diamonds to enhance the incredible center stone. Pick a perfect diamond from our diamond data base. Matching Pave twist band also available in our drop down menu, it's set with 1/8ctw diamonds. Image shown enlarged and complete with matching band and 1 carat center. Stunning Diamond bypass semi mount engagement ring. Style is available in 14k yellow, white, rose gold or Platinum. Diamonds total 1/2ctw before the center diamond. A double milgrain borders each row of SI 1-2 clarity G-H color diamonds. Check out the video. This ring usually ships in 6-10 business days. 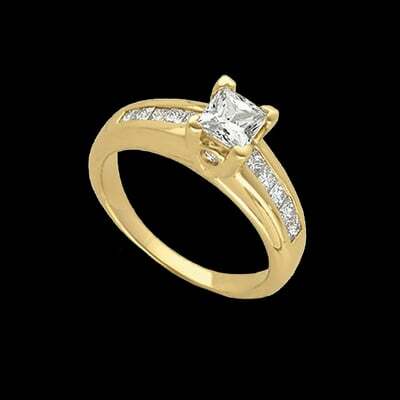 Have your diamond set in this semi mount or pick up a diamond from our diamond data base and we'll set it for you. Lovely ribbon design 14k white gold diamond engagement ring. Ribbon design set with diamond on either side of the center diamond creates this lovely diamond wedding semi mount. Ring is shown with a 1ct center and a beautifully matched diamond eternity band. Diamonds in the engagement semi mount total 1/4ctw and are SI 2 clarity G-H color. 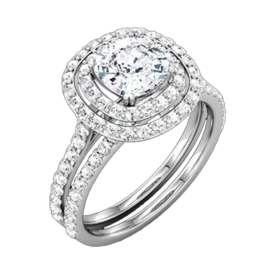 Need a center diamond for this beautiful ring? Check our extensive diamond data base or email for other gemstone pricing. Matching band is set with 76 round diamonds all around the ring and total 1/2ctw. You'll love this diamond wedding set. Custom order this ring in 14k yellow or Platinum. 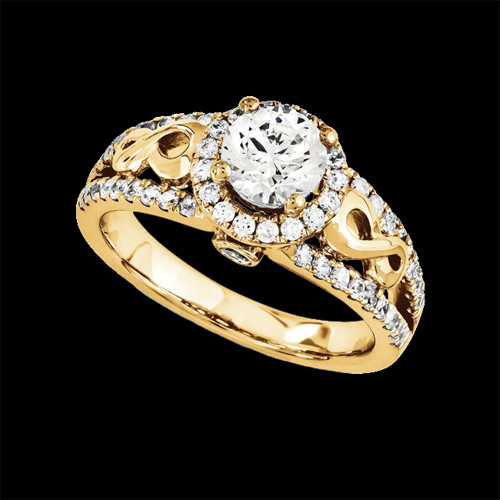 Gorgeous 14k gold East West diamond semi-mount engagement ring. This incredible design is available with an 8x4mm marquise center, a 9x4.5mm, and a large 10x5mm center. Price shown for the 9x4.5mm center size 5, use our request email for additional pricing. Diamonds surrounding the center and on the shank total 3/8ct tw and are SI 2 clarity GH color. This ring measures 2.8mm wide on the should of the shank and tapers slightly to a 2.5mm at the base. 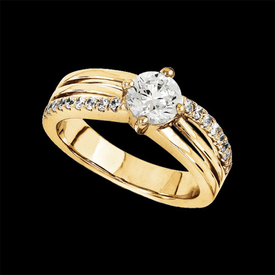 Also available in 14k yellow or rose gold we think you'll love this unique style engagement ring. Platinum also available. Also customize this design to hold an oval or emerald shape center. Center diamond not included but we have hundreds to choose from in our diamond data base. 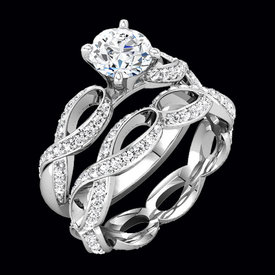 Pretty 14k white gold sculpted design diamond engagement ring. This ring features a square focal point with a round diamond at it's center. Ring is shown with a 3/4ct tw center. Custom order this ring in 14k yellow or Platinum. 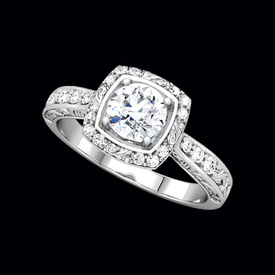 Need a center diamond for this beautiful ring? Check our extensive diamond data base or email for other gemstone pricing. Diamond are SI2 clarity G-H color and 18 round stones set in this design that total 1/6ct tw. Romantic design diamond semi mount. This great design is shown with a 1 carat center diamond (not included) and 1/3ct additional accent diamonds. Semi mount is available in 14k white (shown), yellow, or Platinum selections. Find a perfect diamond in our loose diamond data base or use one you have laying around. Lovely Bar design Diamond wedding ring. 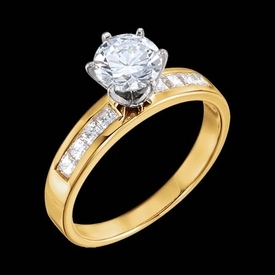 14k Gold holds 3/4ctw diamonds before the 1 carat center. Diamonds in this ring are SI 2 clarity G-I color. Check our diamond data base for the perfect center diamond. We are happy to size this ring for you, sized items are custom and non returnable. Stylish Diamond horseshoe style border semi mount. 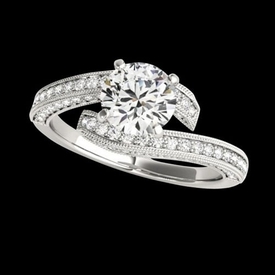 This beautiful style is available in a .15ct and a larger .22ct selection. The smaller version will hold up to a 5.1mm center and the larger will hold up a 6.5mm round center. Lovely diamond semi mount is available in 14k yellow or white gold and Platinum. Matching band is also available for an additional cost. 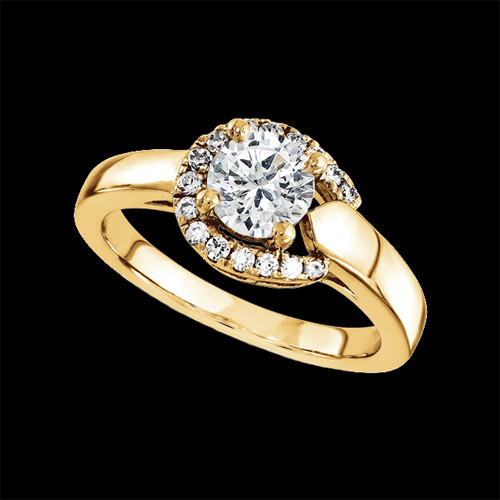 Beautiful 14k yellow gold diamond semi mount. This lovely design features VS2 diamond accents either side of the split band style engagement ring. 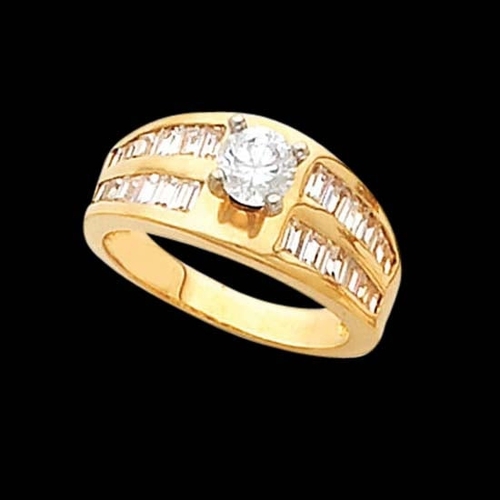 Engagement ring weighs about 7grams and will hold your round center or use our diamond data base to find one. 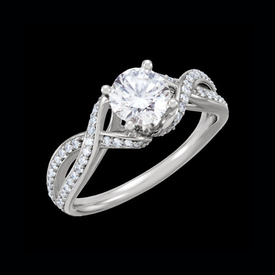 Symbolic beauty, this diamond engagement ring features an infinity design in the band and a diamond halo center. 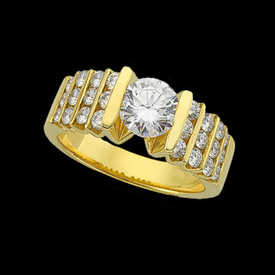 Diamonds border each side of the band are VS2 quality and total .60ct tw. Add your round diamond or select one from our large diamond data base. Riveting 14k White gold halo design diamond engagement ring. 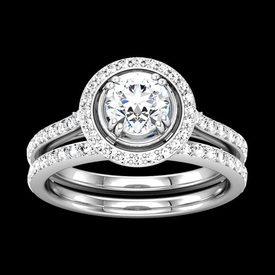 Shown with the matching diamond band, our price is for the engagement ring minus the center stone. Also available in 14k yellow gold, 14k Rose gold, or Platinum. Stylish design is set with 1/3ct tw round SI 2 clarity G-H color diamonds in a halo border around your center stone and either side in this engagement ring design. Center will hold a 3/4 or 1 carat round stone, use one of yours or search our incredible diamond data base for a top quality diamond. Matching band also available at additional cost and set with 1/4ct tw diamonds. Gentle twist 14k White gold diamond engagement semi mount ring. 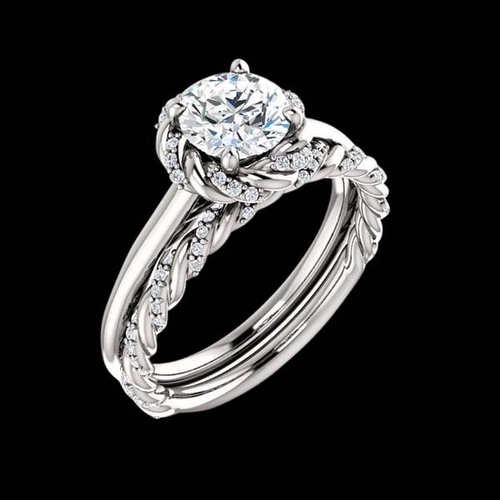 This bridgal engagement ring features a soft gentle twist design set with .17ct tw diamonds. Ring is shown with a 1 carat center and in 14k yellow, rose, or as shown white gold. 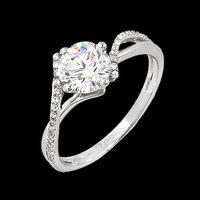 Need a center diamond for this beautiful ring? Check our extensive diamond data base or email for other gemstone pricing. Diamond are SI1 clarity G-H color and 34 round stones set in this design. Fiery 14k White gold diamond engagement semi mount ring. This bridal engagement ring features a split shank into prong design and can be set with a 1/2 to 1 1/2 carat center. Have your diamond set in this ring or find one from our incredible diamond data base or email for other gemstone pricing. Matching diamond band also available for an additional cost. Engagement ring also available in 14k yellow gold or Platinum. Diamond are SI 2 clarity G-H color and 72 round stones total 1/2 ct tw. Matching band also available at additional cost and set with 1/4ct tw diamonds. 14k White gold double Halo design diamond semi mount. 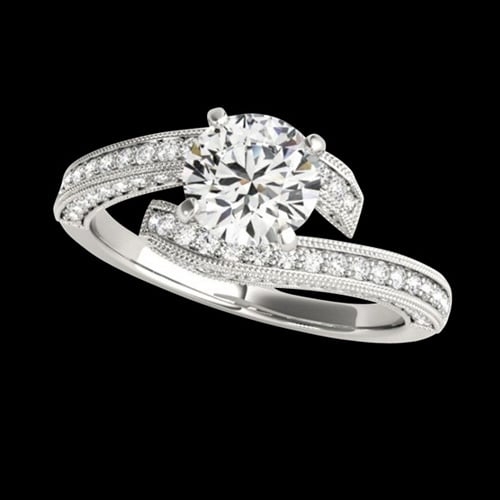 This incredible ring is set with 1/2ct tw round diamonds in the engagement ring before the center stone. Matching band is set with 1/4ct diamonds, diamonds in both rings are SI 2 clarity G-H color. 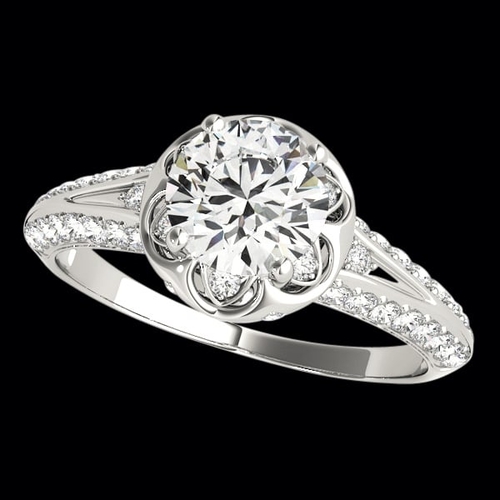 This diamond engagement ring is a very popular Halo design with a bonus second Halo. Ring will hold a Asscher cut center stone with a few size options, shown is the 5.5mm x 5.5mm selection. Center is also available in a 6.5mm x 6.5mm or a very large 7.5mm x 7.5mm selection. This ring shown in 14k white gold is also available in 14k yellow gold, 18k golds, or Platinum. Matching band is available at an additional cost. Sophisticated style 14k Gold diamond semi mount. Princess cut diamonds are channel set to create this design. A round diamond sits below the center diamond on either side. Diamond weight 1/2ct before the center stone. 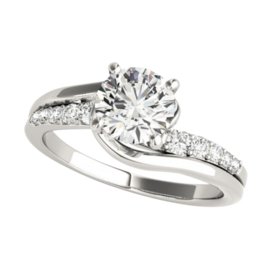 Check our loose diamond data base for center diamond choices perfect for this ring.